An Iron Age hillfort that was later used as a Roman religious site. Chanctonbury sits atop a hill in the chalk downland of West Sussex. The earliest known use of the site occurred in the Bronze Age, about 1500 BCE, with the burial of a young woman, who was interred with a bronze dagger beside her. About 1000 years after the Bronze Age burial a small Iron Age hillfort was created at Chanctonbury. The fort was in use until about 50 AD, perhaps abandoned due to the Roman invasion. In about 300 AD the Romans built a temple within the earthworks of the hillfort, and evidence suggests that farming also took place here around the same time. 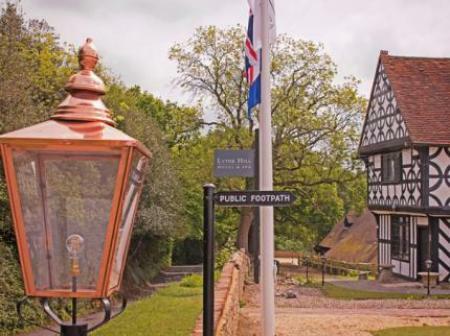 During the reign of Elizabeth I a beacon was erected on the crest of Chanctonbury to warn of the approach of the Spanish Armada. Later, the Goring family erected a ring of trees within the earthworks. These were blown down in 1987, but replanted by descendants of the Gorings. The trees act as an easily recognisable landmark for miles around. About 2 miles away from Chanctonbury Ring is Cissbury Ring, the second-largest Iron Age hillfort in England. 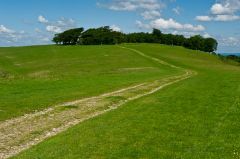 A footpath leads from the Cissbury parking area to Chanctonbury, but most people will visit the Ring from the A283 at Chancton, just west of Wiston Park. Drive to almost the end of the paved road where there is a small parking area. Proceed on foot straight up the road, until it turns into a bridleway. The bridleway winds up the wooded hillside through attractive chalk woodlands until it emerges on top of the downs where you will meet the South Downs Way. There is no signpost to the Ring, which can be confusing (we had to hail a passing cyclist to ask where the Ring was!). Just turn right (west) and follow the South Downs Way up the hill, through a farm gate, and the Ring will come into sight ahead of you. The entire walk from the parking area will probably take 30 minutes for a reasonably fit person, but the exertion is well worth it, for the views to both north and south are superb. Chanctonbury Ring draws most of the visitors to this area, in part because it is more easily accessed off main roads, but it is well worth a short diversion to take in Chanctonbury Ring as well as its more famous neighbour. Location: Parking area on Chanctonbury Ring Road, turning right off the A283. Also reachable by footpath from the Cissbury Ring parking area.